We currently do not have any albums listed on our website for Breakaway Ministries. If you know of any album we are missing for Breakaway Ministries, please contact us via email. Not many preachers have to look at 7,500 empty seats in their sanctuary every week like Gregg Matte. 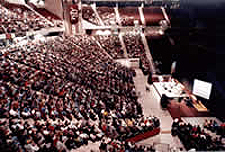 Matte doesnt mind, though, because he preaches to nearly 5,000 college students every week in the basketball arena on the campus of Texas A&M University. Matte, who graduated from Southwestern Baptist Theological Seminary in 1999 after six years of commuting to the seminarys Houston campus, is the founder and director of Breakaway Ministries in College Station. Breakaway Ministries grew out of a Bible study held in Mattes apartment during his sophomore year in 1989. "We had about 12 people," Matte said, "but the Bible study eventually went from 12 to 20, from 20 to 30, from 30 to 50, and on and on."